What impact do cane toads have on biodiversity in Australian ecosystems? Many people think it's a catastrophe when toads arrive - but what is the evidence? Surveys of public opinion often suggest that Australians see cane toads as the worst invasive species in this country – worse even than scourges like rabbits, foxes, cats, pigs, goats, camels and the like. It’s not obvious why people react so strongly to toads – a lot of it seems to be related to an emotional reaction – “YUK, THEY’RE DISGUSTING! !” It’s puzzling to people from other countries where toads of one kind or another are common native species (in Europe, Africa, Asia, and North and South America). Perhaps because most other types of toads are much smaller than cane toads, plus the fact that the local toads “belong there”, these little warty animals often are regarded with affection. It’s hard to find that affection in Australia towards cane toads! Rachael Clark and her colleagues recently conducted surveys to ask the Australian public WHY they hate cane toads so much. Until then, all we had to go on was a general feeling from talking to lots of people about cane toads (taxi drivers, for example, almost always seem to have strong opinions about these animals!). And the main result to emerge from those conversations was the YUK factor – people just don’t like cane toads, full stop. Some people worry about domestic pets (especially small dogs, like terriers) being poisoned by cane toads – and this is indeed a very real problem not just in Australia but in other parts of the cane toad’s introduced range (for example, in Florida). And we’ve heard all kinds of other stories too, like the worry about youngsters in remote communities licking cane toads as a form of drug abuse. So far as we know, these are just stories. If pushed to come up with a reason why cane toads are a problem in Oz (other than “THEY ARE SOOOO UGLY!”), most people talk about ecological impacts on the native fauna. That is, toads are widely believed to kill many native animals, and so cause a major ecological catastrophe in the areas they invade. Some of the community groups have suggested that toad invasion has incredibly serious effects on the native fauna. What’s the evidence for all this talk of ecological catastrophe and biodiversity impacts? The answer is: surprisingly little. Of course, that doesn’t mean that cane toads aren’t a major problem – but the evidence has been remarkably weak until some recent studies by TEAM BUFO and a few other groups. Part of the problem is that the kinds of native animals that are most likely to be affected by toads are big predators, like quolls (marsupial carnivores), large snakes, and goannas. They eat frogs, but can’t handle the poisons in cane toads, and so are killed when they try to eat the poisonous new froglike animal. And because big predators are fairly rare, and often secretive, we don’t know how many are out there in the bush BEFORE toads arrive – and so don’t know how many have been killed by toads. It’s crystal clear that many predators ARE killed by toads – we often find them lying dead with a toad in their mouth or stomach – but the question is, what proportion of the population are killed? Sometimes, it’s a lot! From work by Professor Thomas Madsen and Dr Beata Ujvari at Fogg Dam, as well as Dr Greg Brown’s regular counts, we know that most of the big floodplain goannas were killed by trying to eat toads, within a year or so of the toads first arriving. It’s likely that around 90% of the adult goannas may have died in this way – a huge impact. 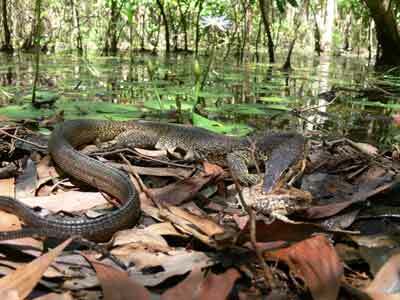 Surveys by Dr Sean Doody and his colleagues show the same situation on the Daly River. Dr Ben Phillips’ work on the Fogg Dam death adders indicates very high mortality also – perhaps 10% or so within a year of toad arrival. In her radio-tracking work, Dr Meri Oakwood has found similarly high mortality in quolls (carnivorous marsupials). One of TEAM BUFO'S researchers, Stephanie O'Donnell, has also been radio-tracking quolls - and like Meri, has concluded that cane toads are a real threat to these attractive marsupials. And in our studies in upstream areas of the Daly and Victoria Rivers (but not in downstream areas like Fogg Dam), lots of freshwater crocodiles are killed when they try to eat toads. In northeastern New South Wales, at the southern front of the toad invasion, Chris Jolly has found similar dramatic declines in lizard numbers when toads arrive in an area. 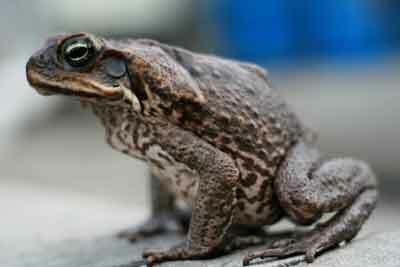 So, we know that predators large enough to tackle a large adult toad are in big trouble when the toads arrive. Fortunately, things aren’t so awful for most of the smaller species. When the toads first arrived at Fogg Dam, we found quite a few dead predators, of a range of species. The most common victims were native tadpoles, who died when they tried to eat toad eggs. Even for the species most often killed, however, our surveys showed no real reduction in populations of those animals. Indeed, many of them increased in abundance, perhaps because of the lessened risk from big goannas, snakes and the like – the animals that had been killed by cane toad arrival. Most of the common snake species around Fogg Dam are actually MORE abundant now than they were in the years before cane toads arrived, based on a huge amount of information gathered by Dr Greg Brown in his nightly surveys (walking across the Fogg dam wall and recording snake numbers just about every night, for 5 years before and after toads arrived!). 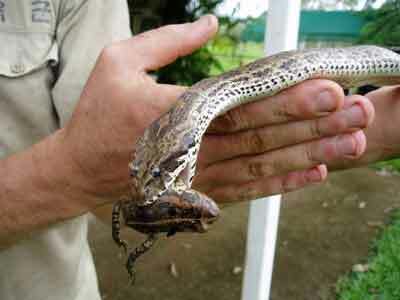 The overall story then, is that when the toads arrive some species (especially big predators) are in real trouble. Others – especially the species that used to be prey for those big predators – probably benefit from the toads’ arrival. And lastly, there’s a lot of species for which toad invasion really doesn’t change much at all. 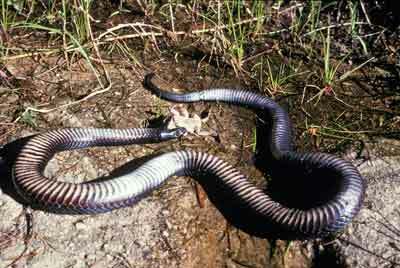 For example, most Australian birds don’t seem to be affected by toads to any significant degree. There are scattered records of a few Australian birds dying after eating cane toads, and one study of toads eating baby birds (rainbow bee-eaters) inside nesting burrows. But the overwhelming majority of Aussie bird species don’t seem to be at any risk from cane toads. Indeed, Christa Beckmann’s work at Fogg Dam has shown that some of the local hawks benefit from toad invasion, because they can scavenge dead toads off the roads. The toads’ poison doesn’t seem to be a problem for most birds, perhaps because of their close evolutionary relationship to birds in Asia, where toads (not cane toads, but species with very similar poisons) are common. Our work in the Kimberley (in collaboration with the Western Australian Department of Environment & Conservation) shows the same situation in many native rodents - they are quite capable of eating a cane toad without becoming ill as a result. 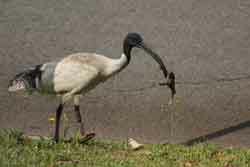 Ibis are able to eat cane toads without a problem. Photo by Jonno Webb. So, toads ARE an ecological problem - but only for a fairly small number of species (the big predators) and fortunately, Queensland populations of many of those species (like yellow-spotted goannas and northern quolls) are recovering, a few decades after the toads arrived and really reduced the predator numbers. Our studies in Queensland confirm that species like yellow-spotted goannas learn to avoid toads as food, and so can coexist with toads. People learn to live with toads also. 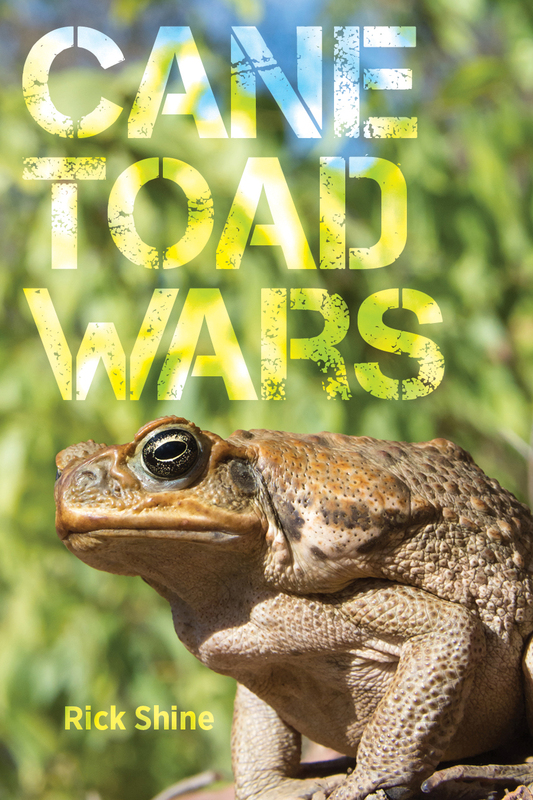 Rachael Clarke's work showed very clearly that the people most worried about cane toad impact were the ones just in advance of the cane toad invasion front. Once toads arrived, and people began to realize that many of their beloved native species were not really affected, the revulsion against toads began to decrease. It seems like the Australian public, like the Australian wildlife, is learning to live with toads. It would be wonderful if we could get rid of them - but even if we can't, we need to understand that cane toads are just one of many challenges that we have inflicted on the environment - toads are a very real problem, but they are by no means the biggest problem facing our native wildlife.